How do detailers get cars looking so picture-perfect? "What wax do you use?" and "What's the best black car wax?" are the questions that come up most often. Unfortunately, it's not quite that simple. If you want the perfect shine, you have to do a little work, and you have to work to keep it maintained. If your car's paint is relatively new and in excellent condition, getting the perfect shine will be far less work than with a car that's five or more years old with heavy oxidation. 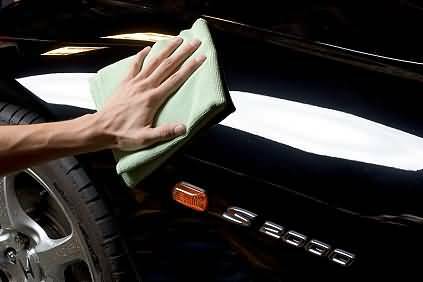 The classic car polishing process I'm about to explain came from years of experimenting with dozens of car polish and wax combinations to discover what products produced the best results. 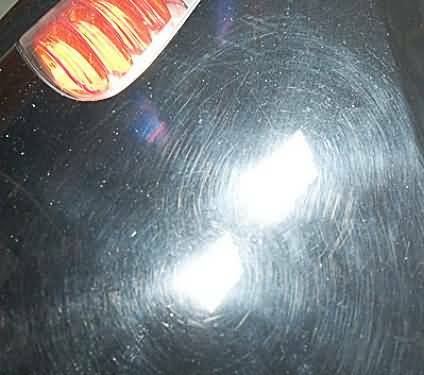 As it happens, this process was discovered quite by accident after applying a carnauba wax over a synthetic sealant on a Guards Red Porsche 944 Turbo.The finish was noticeably deeper, richer and more vibrant. The paint had taken on a new depth, like it had a clearcoat finish. The Perfect Shine classic car polishing and detailing process was born. Grab your auto detailing supplies and let's get started! 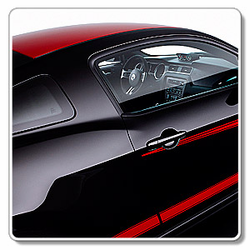 Although this process works well on all cars, it has the most dramatic effect on dark colors. The perfect shine car polish and wax process means your car's paint finish is in good condition, free of surface contamination, polished, glazed, protected and waxed. Let's look at each of these requirements individually. For the first 12 to 18 months of a new car's life, the paint is relatively oxidation-free and in good condition. If you maintain your new car's paint with regular washing and protection, oxidation will remain minimal, and cleaning the paint will be a minor task. At a minimum, you should wash your car weekly. If you don't have time to wash weekly, use the Quick Detailing process. As you drive your car, debris from the road (i.e., tar, oil, bugs, etc.) will lodge itself on your car's paint. The longer this debris is allowed to remain, the more difficult it is to remove. This is just one reason that regular washing with quality shampoo and other auto detailing supplies is so important. While outside, your car will also collect other contamination. (Birds, bugs and neighborhood kids seem to have a natural attraction to beautiful cars.) These contaminants must be removed; you can't wax over them and expect to get a show car finish. Polishing is necessary to remove minor blemishes, including surface scratches, swirl marks, pitted areas (minor road stone nicks) and scuffs. When polished, the paint finish will feel perfectly smooth. Your hand and polishing towel will literally glide over the surface. Feeling a perfectly polished car is a stimulating experience for most car nuts. There's nothing quite like the polished fenders of a curvaceous Porsche, Ferrari, Viper or Corvette. Glaze is a term that's grossly misused in detailing products. Glazes are paint treatments used to fill small surface scratches and swirl marks. To a painter, glaze is the term used to describe the process of restoring full paint gloss. In The Perfect Shine, ultra-fine polishes and other similar auto detailing supplies are used to refine the paint finish to achieve or restore full gloss. Paint is protected when it's sealed from the elements and synthetic sealants offer the best protection. Synthetic coatings are five to ten times more durable than the carnauba waxes. They offer extended protection from the elements and create a super-slick surface. In The Perfect Shine process, the synthetic protection is an acrylic sealant. I have not found a polymer sealant that works. I will explain why later. Waxing is the final step of The Perfect Shine. We're not talking just any wax here; we're talking about a pure, natural carnauba wax. Pure carnauba waxes don't have cleaning properties or synthetic compounds added. They are made from a blend of carnauba waxes, beeswax and natural oils. A quality show car wax gives paint depth and warmth. I know, I know, it sounds like we're talking about a fine wine or something. Just don't underestimate the value of a great show car wax when it comes to the final results of your car's finish. Wash your car twice with a high concentration of car wash solution. I recommend a gloss shampoo. If your car is excessively dirty, you can use Dawn dish-washing liquid. If you do, be sure to rinse thoroughly. Use a quality car wash. If your car is really dirty, like this Honda S2000, mix a strong batch of wash water. After washing and drying, examine your car's paint with your hand. If the paint is not perfectly smooth, use a paint-cleaning clay system and clay lubricant to remove the surface contamination. Inspect your clay frequently to check for hard particles, which should be picked out. Re-mold the clay when it gets dirty to expose fresh clay. Use plenty of Sonus Glyde Clay Lubricant and rub the clay lightly over the paint finish. 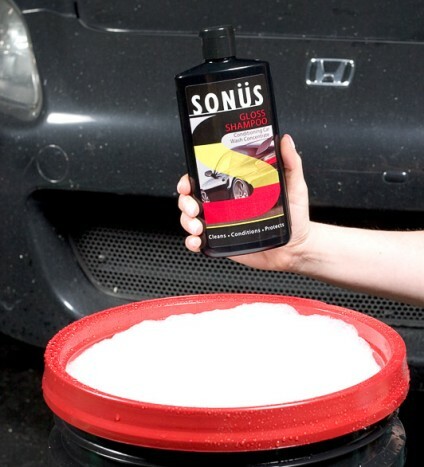 Use a Sonus Der Wunder Polishing Towel to dry and buff the freshly cleaned paint. When the paint is clean and free of surface contamination, examine again for minor surface damage. If you find heavy scuffs or surface scratches, repair these flaws with a fine rubbing compound or scratch remover, like Sonus SFX-1 Restore Polish. If your paint has swirl marks and other minor micro marring, use a swirl remover polish, like Sonus SFX-2 Enhance Polish. You can polish by hand or machine. Working by machine tends to work faster and deliver better results. As you can see in this photo, the swirls, cob web effect and surface scratches are so bad that the paint finish looks dull and flat. Now it's time to glaze your paint to bring out its full gloss potential. For this I recommend a swirl-remover polish formula like Sonus SFX-2 Enhance Polish. Swirl-remover polishes are designed to remove fine swirl marks, not the heavy paint damage removed in the previous step. If your paintwork is already in perfect condition, you can skip this step. Here the entire car was polished with Sonus SFX-2 Enhance Polish and then followed with Sonus SFX-3 Final Finish to bring out this crystal clear finish. The Sonus Der Wunder Microfiber Polishing Towel buffs off the polish residue with ease and won't put swirls back in the paint finish. Once perfectly polished, your paint is ready to be sealed. This is a great time to a product that's been protecting cars for years, Klasse All-In-One. The Klasse AIO acrylic formula has proven its quality again and again. Klasse All-In-One is a one-step acrylic resin that cleans, lightly polishes and protects paint with a durable acrylic finish. The best way to apply Klasse All-In-One is with a microfiber applicator. Klasse All-In-One contains cleaners that remove previous layers of Klasse All-In-One. If you wish to apply additional Klasse acrylic protection, you can apply one or more coats of Klasse Sealant Glaze. Klasse Sealant Glaze does not contain cleaners; it is a pure acrylic sealant. Additional layers of Klasse Sealant Glaze will increase protection and finish depth. Step 6: Make it Pop! You're almost there. The final step, the literal icing on the cake, is show car wax. You may be asking, "After polishing and sealing, why wax?" The answer lies in the richness of color, depth and clarity that only a high-quality carnauba wax can bring out on a polished surface. For this job I reach for P21S Carnauba Wax. P21S Carnauba Wax is a true show car wax. Compared to other show car waxes of similar formula, for the money P21S offers the best final finish. P21S Carnauba Wax brings out a warmth and depth on red and yellow that I have not been able to duplicate with any other wax under $70 per can. It's by far the best black car wax - on black and dark blue cars, the paint looks like a reflection in a pool of water. On steps four through six, I use a quality foam applicator to apply product (except Klasse Sealant Glaze, which requires a microfiber applicator). For final buffing of the P21S Carnauba Wax, I use a Sonus Der Wunder Buffing Towel. 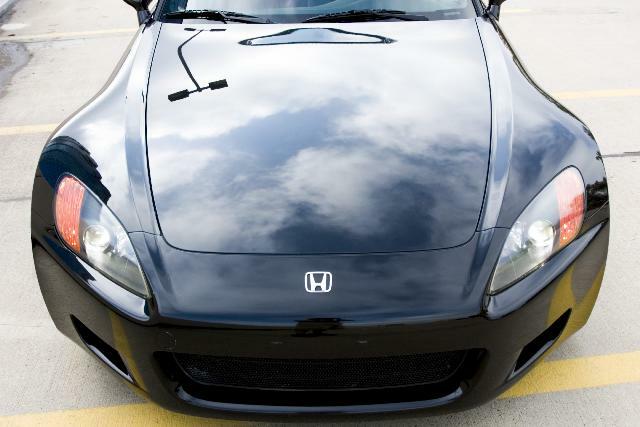 The final Perfect Shine results on this Honda S2000 are nothing less than stunning. Classic car polishing is worth the time and energy - a full day of hard work, but the results speak for themselves. This sports car is ready to show! Quality microfiber polishing towel for a swirl free finish! Super high-gloss clearcoat polish for new cars and show cars. Premium paint restoration car polish.